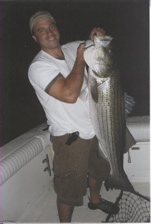 CTFishTalk.com: SNAFU 9/6 South of Block Island - Connecticut Offshore Reports ( CT Offshore Reports ) - A Community Built for Connecticut Fisherman. Headed out from Niantic with Joe, Pops and John for a day of BFT trolling and sharking. Needless to say we took a 2 hour pounding running into close 3-4' seas with an occasional 5' throw in for good measure. Put out a cedar plug spread 2 miles NW of the Grecian Wreck due to a .5 degree temp spike and set a course for Tuna Ridge. 10 minutes into the troll had a tuna come up and take a swipe at a plug just behind the whitewash, missed, then came back and hooked up on the adjacent plug. John brought in a 34" BFT, bled, gutted and put on ice. Now we can relax as the skunk is off, trolled for over 2 hours with no action except for clearing weeds off the hooks. Set up for sharks at Tuna Ridge and had a nice drift thru the Gully to the bottom edge of the Mudhole. Several draggers working the area, at one point we had a thick band of squid on the ff. Joe reeled in a dogfish just before we pulled up to call it a day. Made decent time coming in with wind and waves at our backs, boat was surfing most of the way. 3-4 is no kinda of fun. At least you caught BFT to make it worth your while.